To receive Illinois income tax credit for donating scholarship money you must have a MyTax Illinois account. The process can take up to 2 weeks. Start now so you can be ready to apply for tax credit on January 2nd. If you need support call 800-732-8866 or email Rev.MyTaxHelp@Illinois.gov You will need your social security number and Illinois driver’s license number. Step 1 Request a “Letter ID” to be mailed to you. Click Request a Letter ID link; complete form; Letter ID will be mailed to address on your last IL tax return. 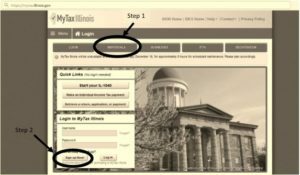 Navigate to mytax.illinois.gov, Click Sign Up Now! button.